MEBENDAZOLE is an anthelmintic. This medicine treats parasitic (worm) infections from roundworms, hookworms, pinworms, whipworms, or infections with two or more of these worms. 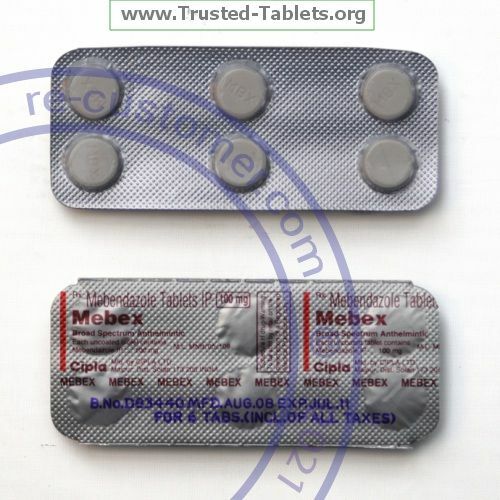 Take mebendazole tablets by mouth. Mebendazole works best when taken with food, especially fatty foods such as whole milk, cheese, or ice cream. You can chew the tablets, swallow them whole or crush and mix with food (such as ice cream or pudding) which is an easy way to give the tablets to children. Do not take your medicine more often than directed. Finish the full course of medicine prescribed by your prescriber or health care professional even if you feel better. Space your doses evenly through the day and night and take at the same time each day. Parasite (worm) death can be slow. To remove all parasites (worms) from the intestines can take several days. If you miss a dose, take it as soon as you can. If it is almost time for your next dose, take only that dose. Do not take double or extra doses. You must leave a suitable interval between doses. If you are taking one dose a day and have to take a missed dose, make sure there is at least 10 to 12 hours between doses. If you are taking two doses a day and have to take a missed dose, make sure there is at least 5 to 6 hours between doses. Visit your prescriber or health care professional to check that your infection has gone. If you still have an infection after 3 weeks you may need a second course of tablets. If you have hookworms or whipworms you may be anemic. Check with your prescriber or health care professional to see if you need iron supplements. If you have pinworms other people in your house may need treatment. Pinworms are spread easily by close contact. Wash your hands, scrub your fingernails and shower often. Every day change and launder bedclothes, linens, and undergarments. This will help keep other family members from getting infected. Disinfect the toilet every day, and damp mop the floors often to reduce the number of worm eggs.